Cook and stir Alfredo sauce in medium saucepan on medium heat 3 to 4 min. or until heated through. Stir in spinach and crushed pepper. Remove from heat; cover to keep warm. Roll dough into 14-inch round on lightly floured surface. Press onto bottom of 14-inch pizza pan sprayed with cooking spray. Brush with oil. Grill 5 min. Slide crust from pan onto barbecue grate. 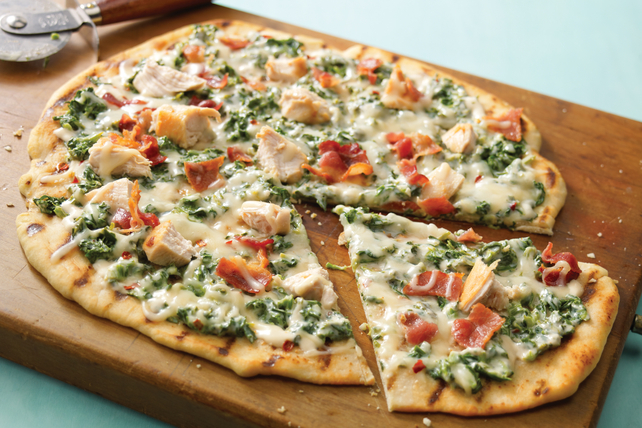 Top with spinach mixture, cheese, chicken and bacon. Grill 5 to 7 min. or until bottom of crust is golden brown and cheese is melted. Heat oven to 450ºF. Assemble pizza in pizza pan as directed. Bake on bottom oven rack 17 to 18 min. or until crust is golden brown and cheese is melted.